It was an unexpected encounter! 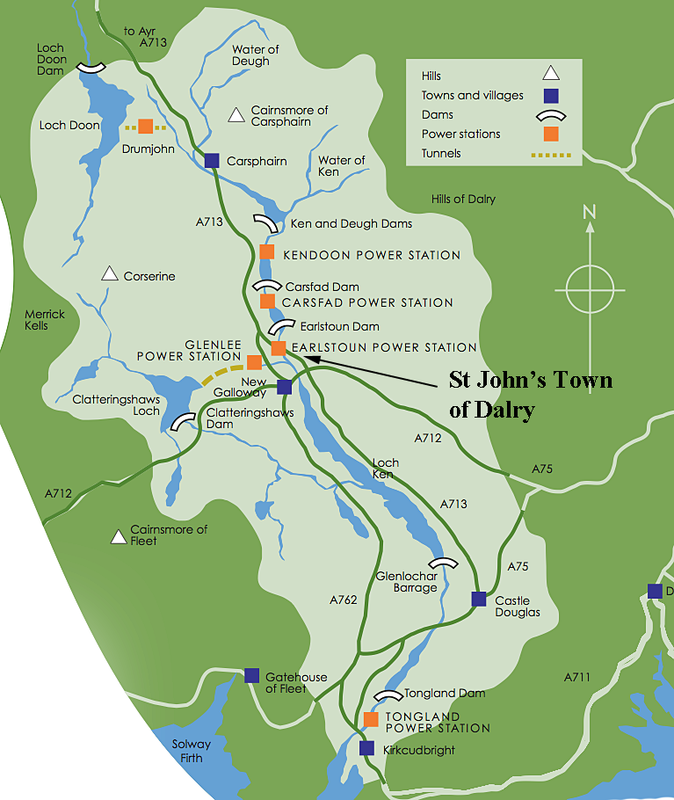 Last Tuesday we had come back to my Mother’s childhood home at St. John’s Town of Dalry in South-West Scotland on family matters, when we heard that the Town Hall was hosting an informational visit by representatives of E-on. Their topic was the planned new wind farm at Loch Urr, itself part of the development of the South West of Scotland as an energy source. Not unexpectedly, there were also protest posters outside, and an earnest young lady inside with a handout to provide an opposing point of view. I had barely made it into the room when I found, to my surprise, that I was entangled in the debate. It was raining, which it does a lot in this part of the country, and a gentleman visitor was wondering why this “gift of nature” was not being used. None of the folk there (on either side of the argument) was willing, nor perhaps even knowledgeable enough, to comment. Sigh! 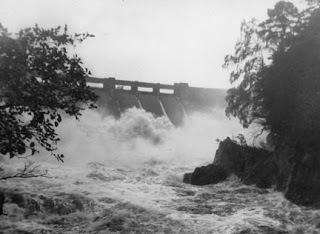 As a child I was first aware of the turbines on the river Ken, which runs past the bottom of the village, when one afternoon while I was still under the age of five, the local power station turned them on, and as the water in the Ken downstream of Earlstoun dam started to rise, my pants got wet, as I sat along the bank. There are six dam/hydro-electric power station combinations around St. John’s Town of Dalry, collectively forming the Galloway Hydros, a complex with an installed capacity of 104 MW that was built in the 1930’s. They have been there all my life, as part of the national power grid since they were installed, and I don’t recall there ever being much controversy over their existence or use, apart from the question of manning levels and automation. Apart, that is, from the minor inconvenience that their use causes due to the rise of the river when the turbines are running. The increase in water flow floods the stepping stones across the river that were a part of the Southern Upland Way (but have been replaced by a small footbridge upstream) and raises the level of the water, at a slow but inexorable rate that can catch unwary children by surprise. (Fast enough to wet the pants of the inattentive, slow enough that they can easily move out of the way before there is a more significant problem). The claim is that the power can be on line to meet demand within 5 minutes. 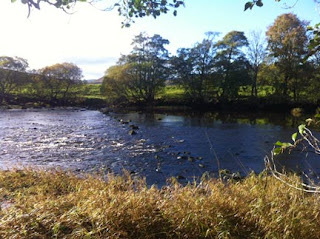 There is already a wind farm just east of Dalry, which, after some searching, we had found on an earlier visit. It is hard to know that it is even there, and has had very little impact on the surrounding scenery, which is an important part of the attraction to the tourists that bring an important support to the local economy. (There is not a huge global demand for Clydesdales, another village business). The E-on representatives were quick to point to artist’s renditions of photos on the exhibit that were intended to show that the new additions would not bring much significant change to these important vistas – far away as they lie from Edinburgh in political miles. Scottish energy independence is a critical part of the platform of the Scottish National Party, who are running a campaign to persuade their countrymen to vote next year to renounce the Treaty of Union of 1707 a hundred years after events brought James 6th of Scotland down to London as the first King James of a United Kingdom. 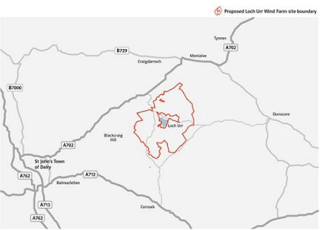 Unfortunately there was not a whole lot of information at the Town Hall on what exactly was planned for the wind farm, nor what the contribution would be to the promise by the SNP leader that the country will become energy independent after a sufficiency of these turbines are installed. On our journey north we had seen how ubiquitous the installation of turbines has been in the past few years. They are part of the landscape from Sherwood Forest on north, and line the coast in Northumberland and Durham, around where the coal pits used to be. This is the land of the golden eagle, where red kites have been successfully reintroduced after disappearing in an earlier time. Will the turbines impact that population? And is it an important enough question to influence a scheme that will bring potential sources of power that will be independent of foreign sources? The trials of underwater turbines seeking to harness tidal power are a lead in to possibly more ambitious plans in the near future. But they have also reminded engineers (as other columns at this site have shown) how aggressive the combination of sand and water can be in cutting apart structures introduced into their environment. A greater percentage of the wind turbines were rotating than I had seen in the past, but this is the time of year when that might be expected. In the less windy days of summer and winter when the need will certainly be greater there is less assurance of their contribution. This is unfortunate since the local economy is not doing well, the housing market is almost non-existent since there are few jobs outside the struggling tourist trade. The roughly 70 long-term jobs that the turbines will bring to the region won’t compare with the numbers that might have come with a resurrection of the coal trade, nor will it replace the disappearing wealth that the declines in production from the oil and gas fields offshore are already imposing on the Scottish economy. Nevertheless the Scottish Government is committed to an energy policy that ambitiously anticipates producing all its electricity needs from renewable sources by 2020. There is no doubt that the UK needs a better energy policy than any of the major political parties is espousing right now – but whether putting hundreds of turbines into a land of great scenic beauty (when visible through the rain) is the right step requires a more detailed answer than was available at the meeting. Editorial Note - my apologies that the Tech Talk post was delayed this week, but the local inn in Dalry changed hands last week, and that meant that the internet was down for the time that we were there, and a series of unanticipated other problems stopped my being able to post until I returned home.